Thistle List can be found on facebook https://www.facebook.com/pages/Thist...22462537853739 and on Twitter https://twitter.com/MarctheMike But from now on also here. What do you think of it? But from now on also here. Lonely the brave (sadly missing from). Finally (another) list with some more rock and alternative music. Some real great songs in there: Magnus, Oscar And The Wolf, Dry The River, Racing GlacIers, Lonely The Brave, also some others, and especially SOUTHERN! On the other hand, nowadays Lana del Rey doesn't do it for me anymore, never can really get into Alt-J, that Alvvays-song didn't do much for me either and Jungle isn't my thing neither. You're right, last time it was rather short. Now I intend to stay longer. ;) Thnx for the comments too, glad you like the Belgian stuff too. Why is it called Thistle List? Love DFA79 and War On Drugs. Hi Blondini, I like my music a bit edgy, a bit stinging like a nettle, but Nettle List, did't sound too well. :( on fact that Childhood is drop out of your chart after only one week on. I know i'm late. At the first listen, I wasn't in to it, but it grew on me. And about Childhood, I wouldn't count them out completely. Great Chart! 4 out of Top 10 is in my Top 10 as well. The War On Drugs was No.2 hit in my Chart earlier this year. Nice to see Jamie T entering your Chart at 12. So perhaps we will share the same No.1 again next week. Merchandise & Strand of Oaks as NEW ENTRIES, thumbs up! I really love the new Lonely The Brave album: The day's war! 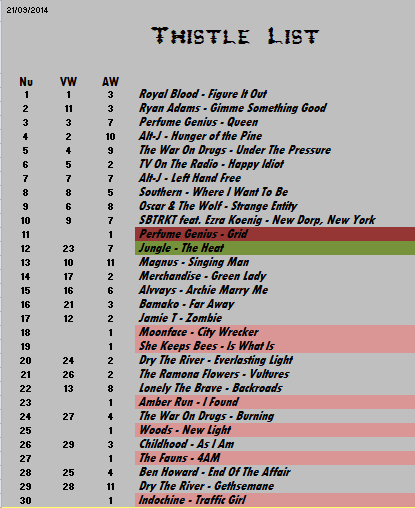 Royal Blood on the throne for the second week, but watch out for Ryan Adams! Ryan Adams song, which is btw good, not reaching top spot on your chart. but a little depressive, don't you think? They were too soft for my taste back then (i was into noise/punk/industrial), not bad with this one. Great chart again this week. Last time I was listening to Cage The Elephant was in 2011. "Thank You, Happy Birthday" was quite a lovely stuff. Reminded me of classic "Pixies" in some places. So i'm looking forward to hear their new work. Navi, if you know Indochine and heard them back in the eighties, you're already around for quite some time too ;) (I'm 46 myself, so I can say this). Two great entries there with Bear In Heaven & The Rural Alberta Advantage! constantly promoted on my favorite internet radio (amazing radio).